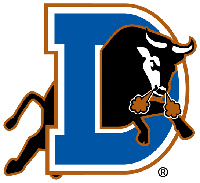 Come out and enjoy the club’s annual Durham Bulls Game with your fellow Harvard alums and local like-minded Ivy+ alums while having some family-friendly fun! The ballpark has been recently renovated, so we will watch the game from a covered box, the SciQuest Party Deck, which is perfect for mixing and mingling while staying covered from the sun. All-you-can-eat buffet and fireworks included! Tickets are $30 each, and children under 3 are free. Tickets must be purchased directly from Yale's registration site (not through the Durham Bulls website) as Yale will be hosting this exciting event. The game starts at 7:05 p.m., and the buffet will be open at 6:30 p.m. Tickets will be distributed at Yale's table outside the ballpark on the day of the game. Tickets available. First come, first serve! When: August 23, 2014, 6:30 p.m.